TÔKYÔ METRO is a work started in August 2008 and completed in September 2015. It is a set of compositions, each corresponding to one of the 214 stations in the Tôkyô subway system. - Is written to the same calibration (17) measures, ie 5/7/5, modelled on the number of syllables in Japanese haikus. - Has a link with the neighbouring composition, either in the type of writing (mirror, polyrhythmic, canon, contrast, etc. ), in recurring pattern or in similarity of the numerators of time signatures. Note that stations connected together can be played either alone or simultaneously, their numerators of time signatures being identical. 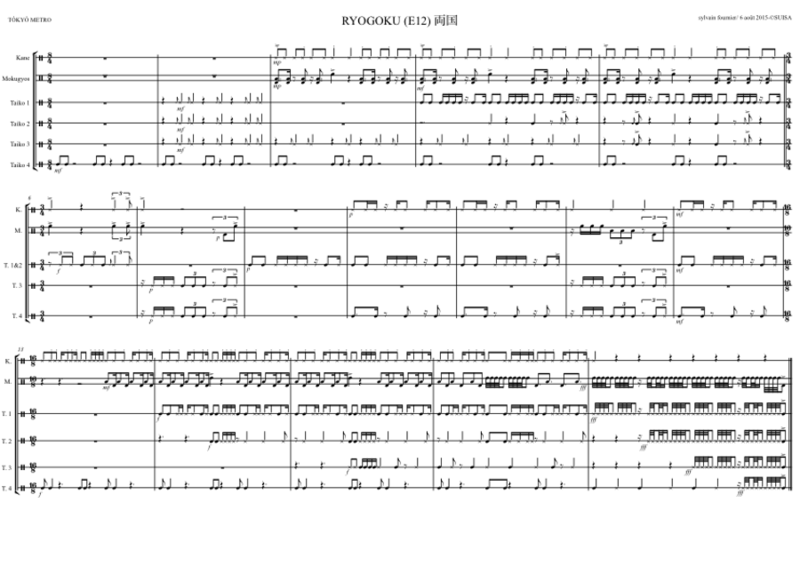 Ideally, TÔKYÔ METRO is written for a group of Japanese percussion instruments, i.e. -1 KANE: a small gong pitched two separate notes (whose sound is similar to the "brake drum" found in Western percussion) played with a small stick whose end is stuck with a kind of small hard hammer. -3 MOKUGYOS or Chinese woodblocks (..! ), three different notes (random). -4 TAIKOS (Japanese drums) of various sizes and sounds, the "1" being the higher pitched drum and "4" the lowest. 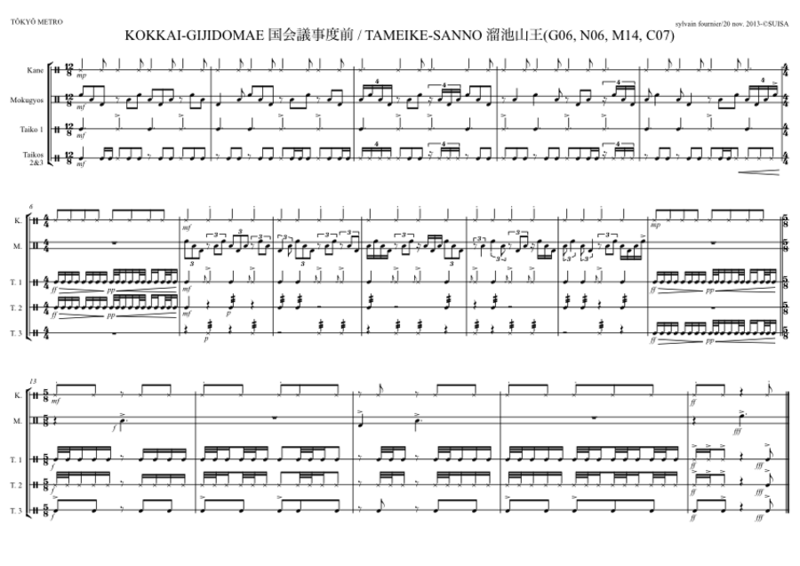 Given the wide variety of existing taikos, the instruments will be chosen according to their availability or, if possible, according to the taste of the players. A feature of these compositions resides in the fact that the tempo is never indicated. The performers themselves choose the interpretation tempi according to their taste or ability. 1) Ideally, choosing on the map a route between two stations and playing the original suite created with intermediate stations. 2) Simply by selecting and playing one or isolated stations, according to a predefined theme (rather for interpreters from Japan..!) or not. It is possible to further expand the range of possibilities in alternating compositions of TÔKYÔ METRO with improvisations by the performers or other interventions (improvised or not) by other artists, musicians, poets, dancers, storytellers about selected stations, etc. Have a good underground trip! Order the complete pack of compositions (in score format as in the examples below) for 39€ or 42CHF. ORDER HERE (Payable with Paypal or bank transfer).